Bright blue eyes are a ragdoll trait. Ragdoll cats are gentle giants. These large kitties have a reputation for being mellow, affectionate and sweet. They adapt easily to their people's lives, get along well with other pets and kids, and make good apartment-dwellers. A ragdoll just might be a perfect fit for your laps and life. Ragdolls are mellow sweethearts, extremely loving and gentle. They dote on their people and usually prefer snuggling with a human over performing acrobatics and high-flying antics. Your ragdoll will probably stick close to you, shadowing you around your home, warming your lap and claiming space on your bed. If you have other pets, a ragdoll can be an especially good addition to your family, because this breed tends to get along well with dogs and other kitties. Ragdolls are also a great option if you plan to have children someday; they’re usually mild and patient with kids. Ragdolls are among the largest cat breeds, with neutered males ranging between 15 and 20 pounds and spayed females weighing between 10 and 15 pounds. They often don’t reach their full size and heft until they’re 3 or 4 years old. In addition to their sturdy build and gentle nature, ragdolls are known for their striking blue eyes and soft, medium-length coats. They shed less than you might expect, and regular brushing should keep your kitty’s hair clean and free of mats. Before you buy a kitten, research the people selling ragdolls. 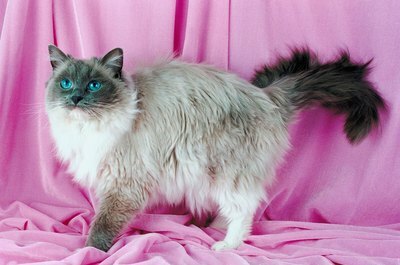 Organizations such as the Ragdoll Fanciers’ Club International (rfci.org) and the Cat Fanciers’ Association (cfainc.org) provide lists of breeders who produce healthy, well-adjusted kittens. Ask your breeder for guidance on raising your new pal, kitten-proofing your home and finding the right vet. Don’t change your kitten’s diet; different food might make him sick to his stomach. Most of all, spend a lot of time playing with your kitten, and give him all the love and cuddles you both crave. Ragdolls aren’t big talkers, so if you want a quiet kitty, they’re an excellent choice. A ragdoll can adapt to just about any size home, whether you live in a mansion or studio apartment, but needs to be an indoors-only pet. They get their name from their tendency to go limp, like a rag doll, when they're picked up. The breed developed during the 1960s from stray and domestic, non-pedigreed cats selected for their hair length, coloration and personalities. With the attention to their dispositions, today’s ragdolls combine intelligence, an ability to learn quickly, a playful nature and quiet affection.